How do you choose the best wine opener? There are several styles available these days, each offering different features and advantages. It’s no longer a simple battle between corkscrews vs electric wine openers. Manual corkscrews have come a long way since the classic straight pull corkscrews, and electric wine openers are now affordable as well as precise. 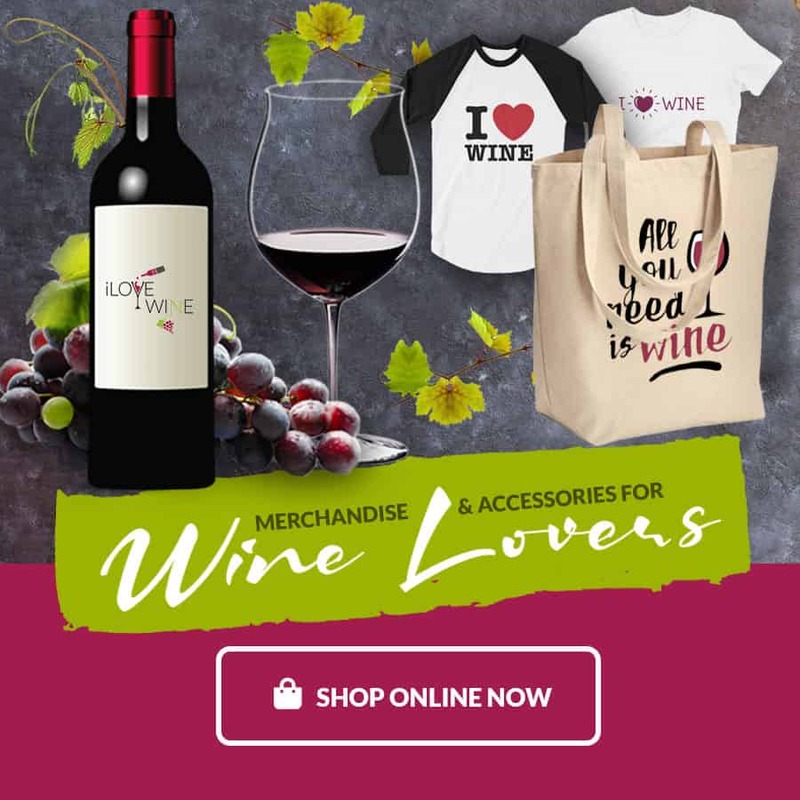 This is wonderful for the wine community as a whole, allowing more options to suit your personal style as well as your needs. Whether you choose a manual corkscrew or an electric opener, it should be comfortable in your hands and easy to use. The opener should also remove the cork seamlessly, without breakage or leaving bits behind in the bottle. It should also handle all standard sizes, whether the cork is natural or synthetic. Beyond that, choosing a wine opener is a matter of personal preference. Here are some of our favorite wine openers of each type. Historically, manual corkscrews could be somewhat of a challenge for the uninitiated. Fortunately, clever designers have added hinges for better leverage to make these even easier to use. Waiter’s corkscrews are popular because they’re compact and usually contain several tools, much like a Swiss army knife. In addition to the corkscrew, most also have a foil cutter and a bottle opener. The Barvivo is a beautiful little all-in-one waiter’s corkscrew. It has a double-hinged fulcrum to make dealing with long corks easier. The spiral has a “double worm” design to grip both synthetic and natural corks firmly. We also love the weight of the corkscrew, which makes it easy to handle. The handle is available in rosewood, as well as a variety of colorful resins. Between that and the cute packaging, this makes an excellent gift for new wine lovers. The Prestige from Coutale Sommelier also makes a marvelous gift. Once again, we love the weight of this corkscrew and the craftsmanship is bound to make an impression whenever you use it. While winged openers are easier than the old school corkscrews, we find them a little clunky to use. Maneuvering the wings and thumbwheel can take some practice and there are other easier-to-use styles on the market. Still, we know they have diehard fans out there, so we’ll recommend one. 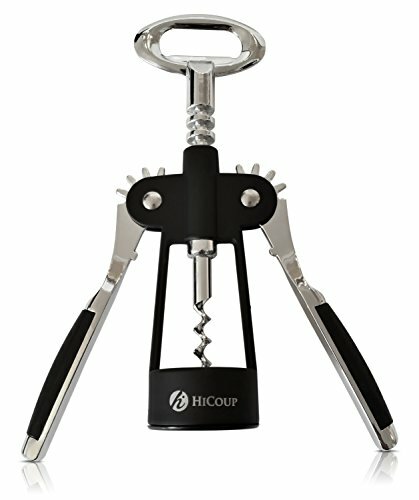 The HiCoup Wing Corkscrew opener is one of the more comfortable versions of the winged corkscrew that we’ve tried. 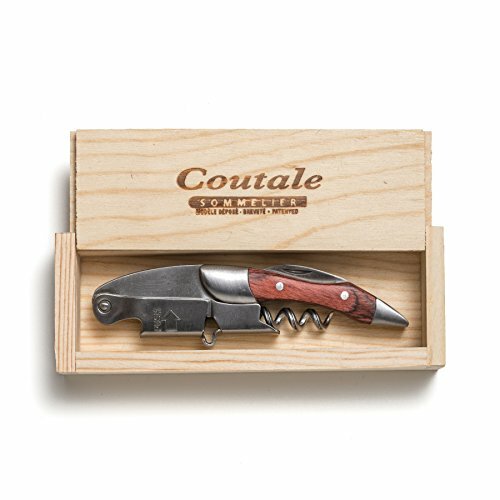 The corkscrew has a nonstick coating to help it slide into the cork and the knob is wide, making it easy to turn. This set also comes with a wine stopper in case you leave the bottle unfinished. Both items arrive in a felt-lined gift box which is also useful for storage. 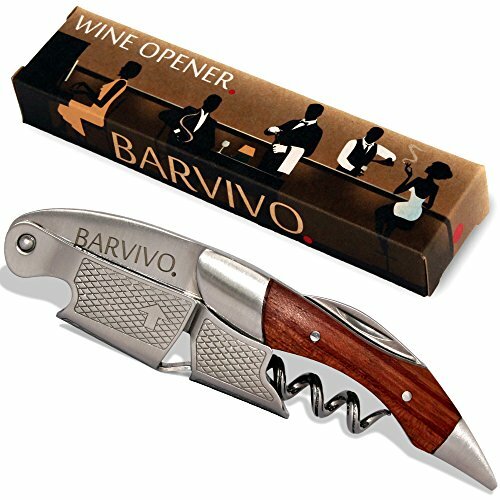 Lever openers are a quick way to manually open a bottle of wine. Simply place the opener over the bottle with the spiral by the cork and the lever in the up position. When you press the lever, it will gently force the spiral straight down into the cork. Pull the lever up and the cork will come with it. The OXO SteeL is a marvelous lever corkscrew. Like other OXO products we’ve tried over the years, it impresses with both its durability and its design. It’s simple to correctly position and the lever lifts and lowers easily. We also love that the foil cutter clips into the body of the tool for quick storage. We miss having a bottle opener, but appreciate that it comes with an extra replacement spiral. The Brookstone works similarly to the OXO SteeL, but has a slightly different design. The handle is a little longer, which gives more leverage. If you prefer more stainless steel to the black body on the OXO SteeL, that would also give this model the edge. Unfortunately it does not come with any extra accessories or replacement parts. If you’re accustomed to manual wine openers, electric wine openers may feel strange at first. You won’t feel the resistance of the cork in the same way, nor feel the control as you pull it out. You will find, however, that they’re wonderful for quickly opening bottles of wine with very little effort. 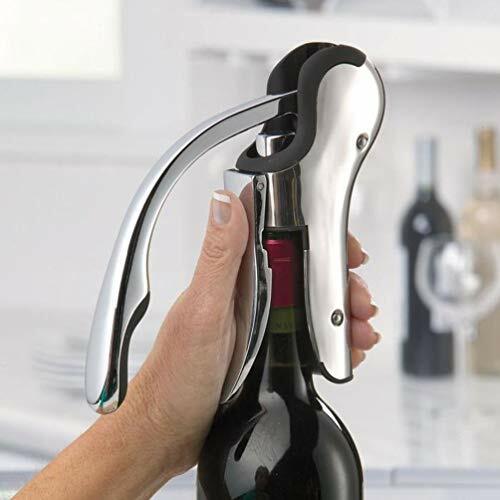 This is also perfect for wine lovers who have difficulty holding and manipulating manual corkscrews. 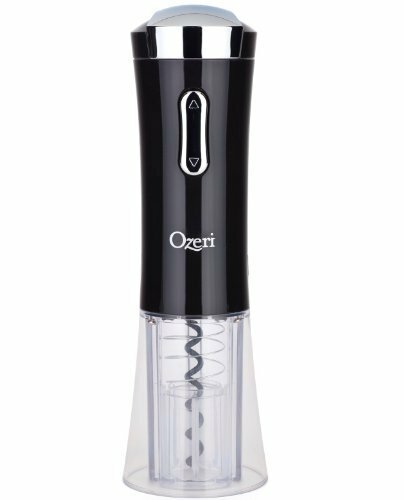 The Ozeri Nouveaux is an electric wine opener that pulls the cork with the push of a button. The battery holds enough charge to open 40 bottles of wine and the unit stands upright without a base thanks to its hourglass design. It also has a foil cutter nested inside the removable lid. We love that this opener is available black, red, or silver, offering some flexibility of styling. Most of all, however, we love the price point. 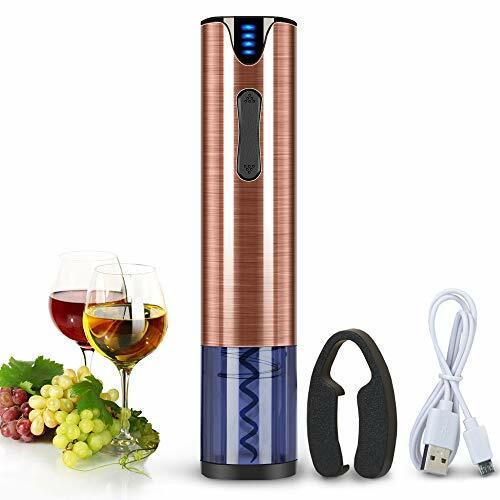 It’s incredible that you can get a good electric wine opener for less than $20. SIMPLE PUSH-BUTTON OPERATION - The electric wine bottle opener removes the cork in seconds with no extra effort. Spend less time struggling with your wine and have more time to enjoy wine with family and friends. 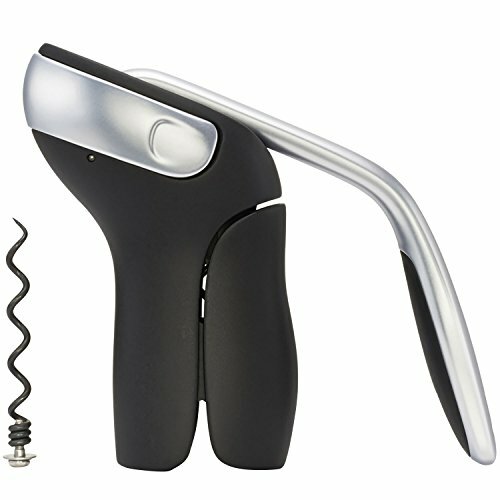 The FLASNAKE wine opener is another affordable electric corkscrew that gets excellent marks for design and performance. It comes in rose gold and, like the Ozeri, has a clear chamber at the bottom so that you can watch the cork extraction. It removes the cork in seconds and can handle 80 bottles of wine on a single charge. This opener also comes with a foil cutter and a USB charging cable. There’s no stand for this opener either, though we find this useful if you don’t want to display it on your countertop. It fits neatly in your pantry or drawer until you’re ready to use it again. For the price, this opener is surprisingly durable and holds its charge well.